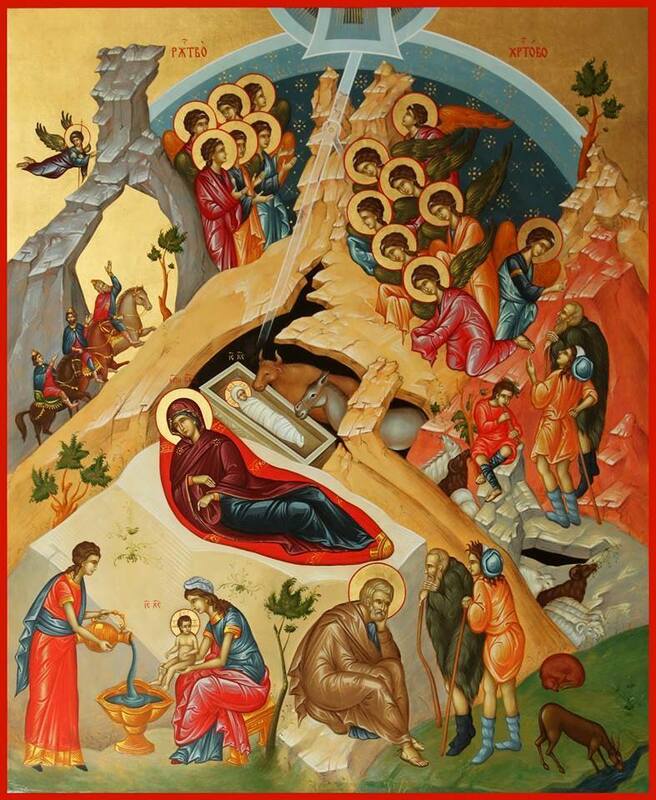 Icon of Jesus Christ "The Bethlehemite"
"Seeing Christ’s healing temple opened, and how health streams from Him to Adam, the devil suffered and was stricken. Then he wailed as if in mortal danger and to his friends raised a bitter howl: what shall I do to the Son of Mary? The Bethlehemite is killing me, Who is everywhere present and fills all things." "Come, let us hymn the Mother of the Savior..."
Come, let us hymn the Mother of the Savior, who after giving birth, remained a Virgin. Rejoice, O animate City of our King and God, in whom Christ dwelt, having worked our salvation. 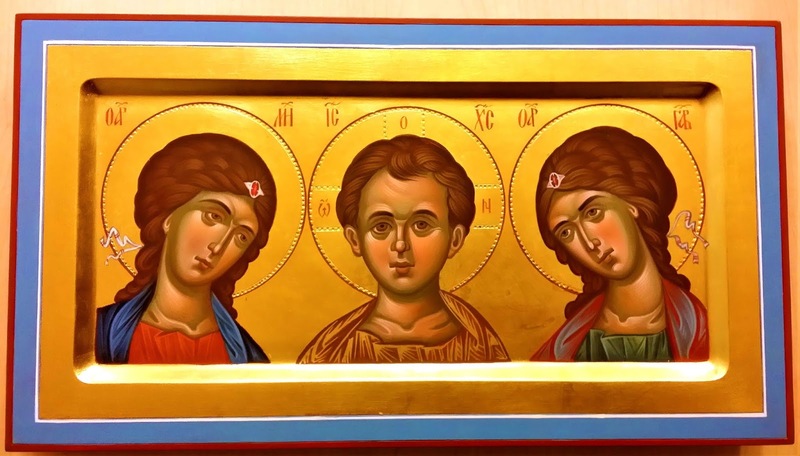 Together with Gabriel we hymn you, together with the Shepherds we cry out: O Theotokos, intercede with Him Who took on flesh from you, that we be saved. 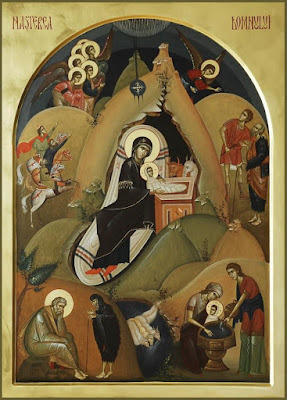 The first and great Kontakion of St. Romanos the Melodist, written through God's help in honor of His Nativity in the flesh. we have found delight in secret, come, let us receive the joys of Paradise within the cave. from which David once longed to drink. and has quenched at once Adam’s and David’s thirst. "Let my spirit be counted as nothing for the sake of the cross, which is a stumbling-block" to those that do not believe, but to us salvation and life eternal. "Where is the wise man? where the disputer?" Where is the boasting of those who are styled prudent? For our God, Jesus Christ, was, according to the appointment of God, conceived in the womb by Mary, of the seed of David, but by the Holy Spirit. He was born and baptized, that by His passion He might purify the water. "Now the virginity of Mary was hidden from the prince of this world, as was also her offspring, and the death of the Lord; three mysteries of renown, which were wrought in silence by God. How, then, was He manifested to the world? A star shone forth in heaven above all the other stars, the light of Which was inexpressible, while its novelty struck men with astonishment. And all the rest of the stars, with the sun and moon, formed a chorus to this star, and its light was exceedingly great above them all. And there was agitation felt as to whence this new spectacle came, so unlike to everything else [in the heavens]. Hence every kind of magic was destroyed, and every bond of wickedness disappeared; ignorance was removed, and the old kingdom abolished, God Himself being manifested in human form for the renewal of eternal life. And now that took a beginning which had been prepared by God. Henceforth all things were in a state of tumult, because He meditated the abolition of death." "Yes, my good children! My joy was so great from the nativity of Christ, that I couldn't keep it to myself. I said to myself, 'O Iakovos, go into the forest to chant: 'Christ is born, glorify Him''. And as I was changing the birds came and chanted together with me." 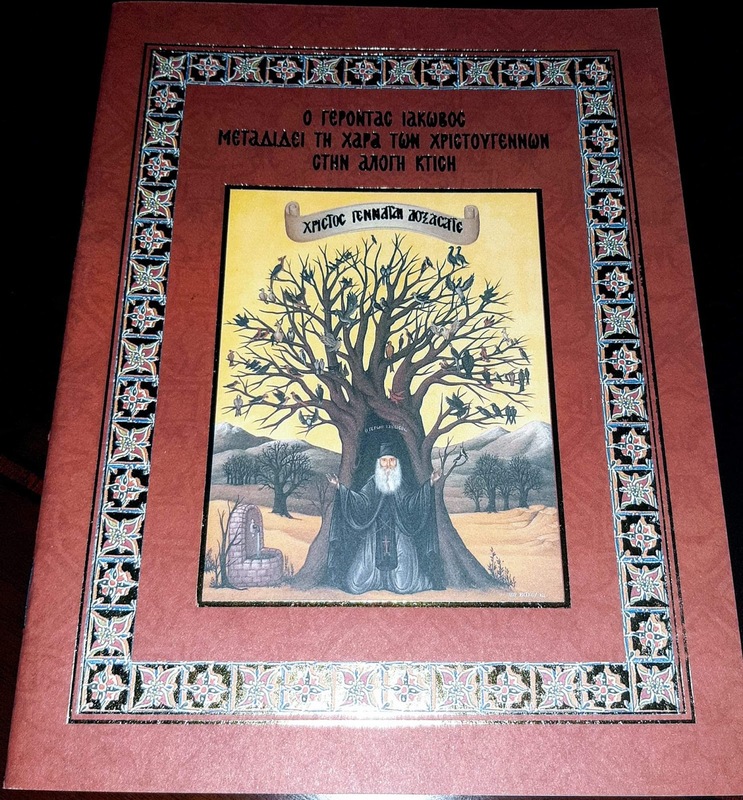 This St. Iakovos of Evia told to students who came as pilgrims to the Monastery of St. David, when, after the vigil of Christmas, they took a walk in the forest and saw the holy elder chanting, surrounded by birds. "With every "Lord Jesus Christ, have mercy on me," it is like casting an atomic bomb in the heart of the devil..."
When a man says: "Lord Jesus Christ, have mercy on me," do you know what happens? It brings energy, it brings the Grace of the Holy Spirit puts it in action. He orders this "fire" of Divine Grace, to be worked throughout the earth. And how is this done? It brings joy to the angels, and brings sadness and enflames the demons. It is a further hell for the demons. With every "Lord Jesus Christ, have mercy on me," it is like casting an atomic bomb in the heart of the devil (and because of this, [the devil] fervently puts up roadblocks) and it will be heard unto the ages of ages, not because we ourselves have this Grace, but because the name of Jesus Christ itself carries this energy and Grace and has so much power, as much power and Grace that His Godhead has! E) to have an order and daily program of spiritual duties in the realm of silence and compunction. "The Lord glorified you with a multitude of wonders and awesome deeds..."
The Lord glorified you with a multitude of wonders and awesome deeds, O blessed one, for in the holy Synod, you proclaimed the Holy Trinity, and you raised the dead, and transformed the snake into gold, and paradoxically, you turned back and passed through the raging river through your prayers. Well done, good and faithful servant! Well done, worker in the vineyard of Christ! You bore the heat of the day, and to you was given the talent, while you did not grumble against those who came after you. Therefore, the gate of the heavens have been opened unto you. Enter into the joy of your Lord, and intercede on behalf of us, O St. Nicholas. 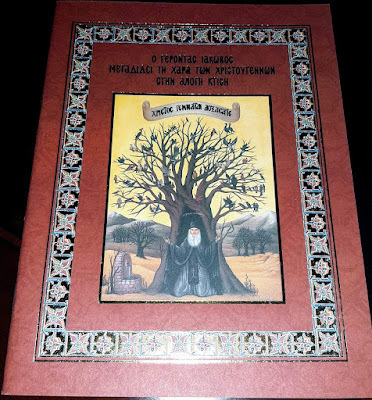 "You were mystically illumined with the radiance of the Spirit..."
You were mystically illumined with the radiance of the Spirit, and were thus shown forth to be a true prophet of noetic and divine things, O Porphyrios. For through your zeal for ascetic deeds, you overtook all, reaching a height of virtues hard to climb. And having received a multitude of gifts from the Spirit, you grant many gifts and wonders to those who entreat you, while your life instructs all, calling them to repentance. But, O venerable and compassionate Father, intercede for salvation of souls for those who of those who take refuge in your boldness [before God]. The Holy Monastery of the Transfiguration of Christ (celebrated August 6th), though technically a dependency, was founded by St. Porphyrios of Kavsokalyvia in Milesi, Attica, geographically between Oropos and Malakassa in the northern suburbs of Athens. From one's first step as a pilgrim in the area, one encounters the sanctity of the place and the total silence. One is struck by the astonishing Holy Church and the beautiful green surroundings. A multitude of people hasten to the holy Hesychasterion which honors the memory of the Venerable Porphyrios on December 2nd, the day of his repose, in order to partake in the grace of this Saintly Elder. The building of the monastery began in 1981, and the building occurred in stages, with the Katholikon being founded in 1990, with permission of Archbishop Seraphim of Athens. 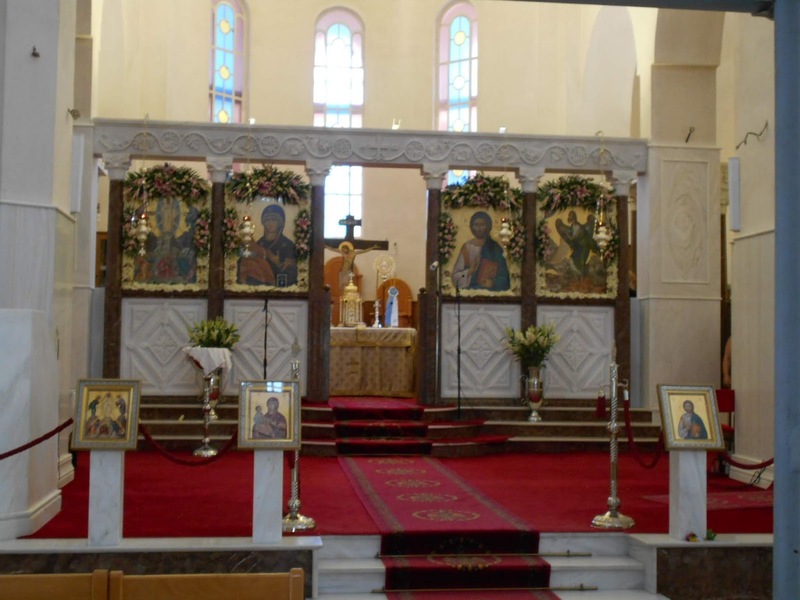 The walls of the church were completed in the spring of 1992, a few months after the repose of St. Porphyrios. 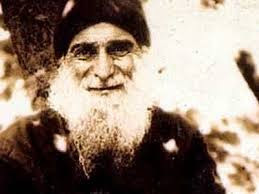 After St. Porphyrios retired from the chaplaincy at the Polyclinic of Athens (St. Gerasimos near Omonoia), he lived a few years at St. Nicholas in Kalisia, Penteli, but ultimately moved to Milesi of Malakassa, where he continued to live humbly, struggling with his illnesses. That place became a true pilgrimage. The Elder chose obscurity, but God glorified him. "The world," as he wrote later, "took me from my good place, and everyone calls me a saint. However, I feel that I am the greatest sinner of the world...and I entreat all those who knew me to pray for me." 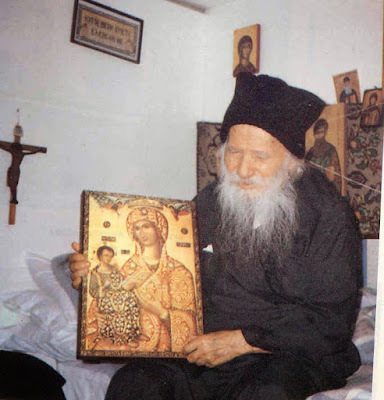 His last breath was humble and far from the world in Kavsokalyvia of Mount Athos, on December 2nd, 1991, as he had been informed by God that his end was near. His repose was known only by his fellow cell-mates in Kavsokalyvia, and so his funeral was humble in the Garden of the Panagia. The Monastery is open from sunrise to sunset, except for being closed from 2-4PM daily. Vespers is served daily at either 5PM (winter hours) or 6PM (summer hours). 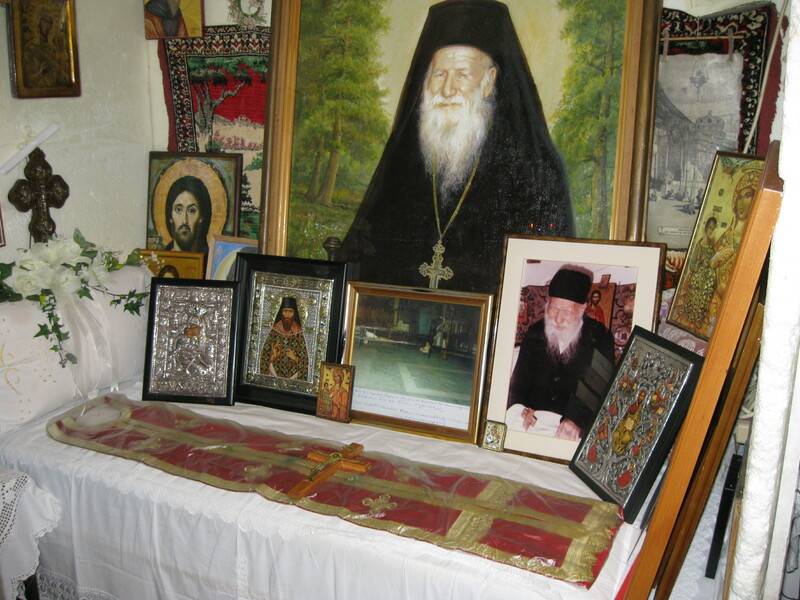 Orthros and Divine Liturgy are served every Sunday from 7-10AM. 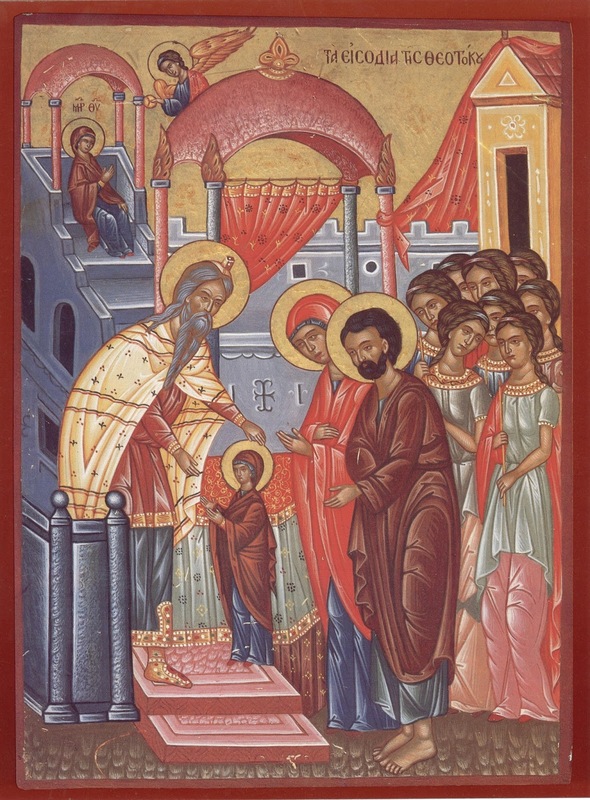 "Mary, the spotless one, and spiritual tabernacle..."
Mary, the spotless one, and spiritual tabernacle, is offered today in the house of God, and is received by the hands of Zacharias, as a sanctified vessel of the Lord. O, your wonders surpassing mind, O Spotless One! Strange is your nativity, strange the manner of your raising, and strange and paradoxical is everything about you, O Bride of God, and inscrutable to mortals. Behold, a joyous springtime has shone forth today to the ends of the earth, gladdening our soul and mind and nous with grace, at the festival of the Theotokos today, and let us mystically rejoice. “Sometime ago, we invited a local “tree surgeon”, Leo M., to cut down a couple of dead trees in the back of the church property. He came and worked with his wife, Kathleen, doing the job quickly and with kindness to the rest of the surroundings. But they strongly resisted being paid, insisting on offering their work gratis to our church. The reason for it was the following story that happened to them a few years before, just after they had gotten married. They both were big enthusiasts of serious mountaineering and rock climbing, and therefore for their honeymoon trip they decided to go to Alaska, to bag the highest peak of North America, mount Denali (aka McKinley), 20,320 feet. They prepared their expedition very thoroughly, staying in the camp at the foot of the mountain, talking to guides, studying the maps, checking the equipment, and waiting for a long stretch of good weather. Everything went just fine for a few days of their exciting, but extremely difficult ascent. At the end of one day, on a narrow path, they met an old, strange looking man in a long robe, who was walking down the mountain. In a friendly manner he greeted them and advised them to turn around and return to the base camp as quickly as possible because the weather was changing into a bad storm. Soon, he said, it will be very dangerous around here. And in answer to their unasked question, how could he know such a thing, he told them that he is local and knows the climate very well. Leaving them surprised and uneasy, he continued on his way. A few minutes later, when Leo and his wife made a wise decision to turn back and tried to recall the appearance of the old man, they realized that he hadn’t had a back pack or any other hiking gear with him. How could he have made it up so high in the bare rocky mountain in sub-zero temperatures and without any food or protection?! Anyway, to make a short story shorter, a few days later, almost at the bottom of the mountain, they were indeed caught by a severe storm. They survived it, constantly in their minds thanking the old man who had warned them of the danger. A week later, still staying at the base camp, they were told that some other climbers, who were at the higher elevations than they during the storm, never came back. But the focal point of the story is this: at the camp cafeteria they noticed a picture of their rescuer, pinned on a bulletin board between all kinds of papers and photos of the mountain. They recognized him from the first, at a glance. 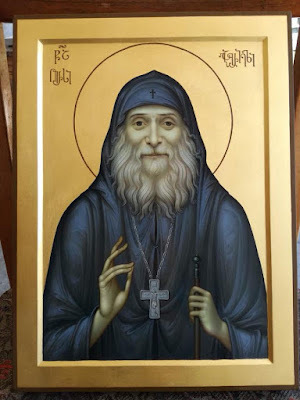 When they asked the waiter about his name, he told them, ” It’s St Herman of Alaska.” The photo was of the icon of St Herman from the Orthodox church nearby. “By enduring the trials of nature, the storms’ cold and wind together with hunger, thou didst kindle spiritual peace, warmth and satiety, and become unaffected by the elements, truly a heavenly man and earthly angel, O wondrous Herman; so wishing to honor thee as is meet we cry out: Rejoice, conqueror of nature’s hardships! Rejoice, thou who wast arrayed in the virtues! 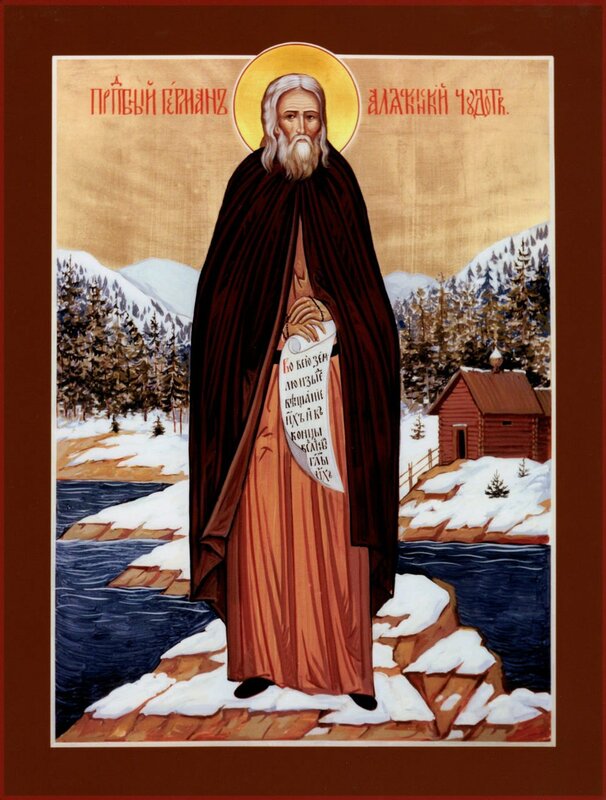 … Rejoice, O venerable Father Herman, adornment of Alaska and joy of all America! ” (From Akathist to St Herman)"
We know that the nous that writes an encomium such as this must become angelic and heavenly. We know, however, that fervor moves us many times to speak about God. And if God, the Creator of the Angels and all creation, moves us to speak thusly with divine eros, why should it be paradoxical to speak a few things about the divine General, whom I entreat to grant us the grace of God? And before, thus, I seek divine grace and the life-creating Spirit to richly enlighten my poor thoughts. For without Him, no man can speak of heavenly things. This heavenly fervor moves me to praise the heavenly General, but my earthly mind and my corrupted flesh pulls me down. 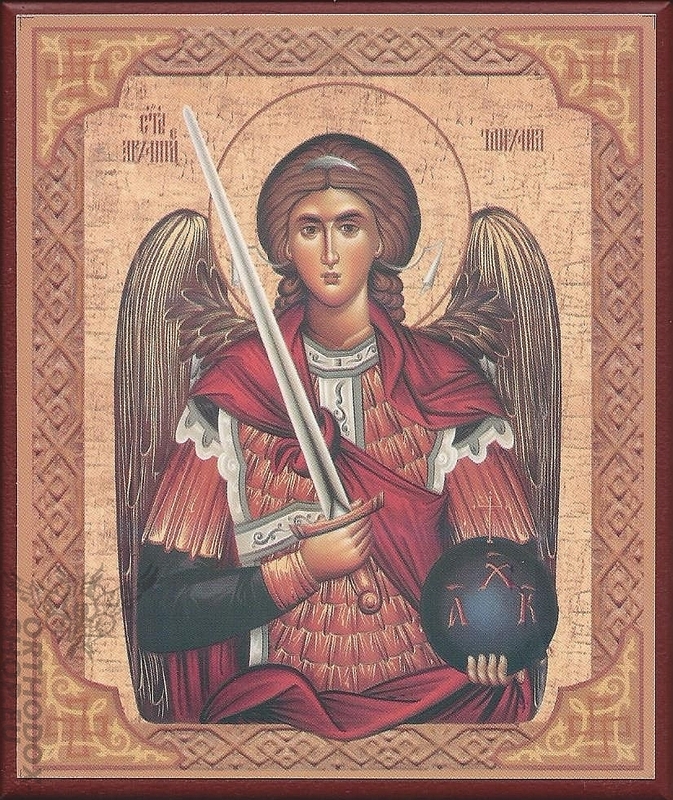 But you, O great Archangel, raise me upwards, "cleanse my tongue", strengthen my hand, and grant grace to my nous, that I might be able to praise and salute your grandeur, that my desire might be granted to finish this word. I think that it is better to begin salutations, from Him Who granted to you existence and authority. Rejoice, O Tachiarch, creation of the Beginningless Light and the second light, together with your fellow Angels. Rejoice, O Taxiarch, creation of the eternal and radiant and fire-bearing Light, together with the other heavenly powers. Rejoice, O Taxiarch, who never thought of yourself more than is right, not of the height of glory that was granted to you, but you always think of Him Who created you, and honored you and glorified you. And with thanksgiving you keep faith in Him unshaken, and with humility you serve Him with obedience, as befits the Creator and Almighty God Who holds all things. Well done, well done, almighty one, for your decision worthy of praise, and who to him who was high-minded and prideful, who thought of evil things and perceived disastrous things, and desired to place heaven as his throne, and to place in submission his ranks, desiring to be life the Most-high One. 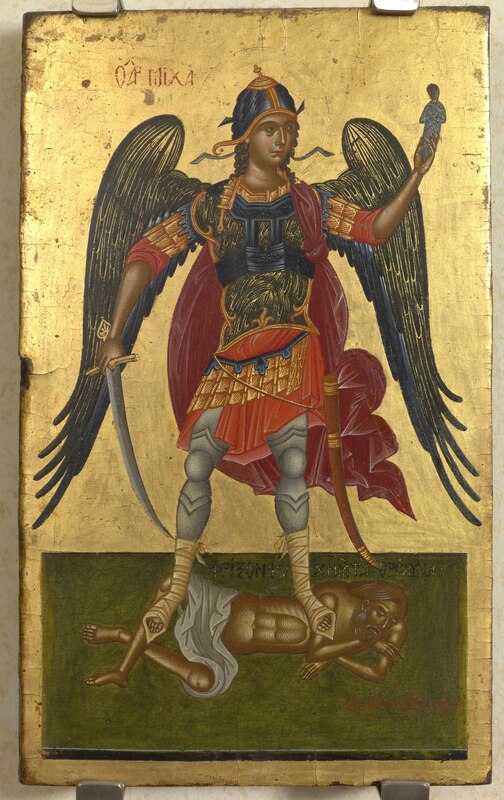 He [Satan], rightly was rewarded and became from an Archangel into an Arch-demon, from radiant to dark, instead of an exalted throne and heavenly clouds, he became one below and inherited the mansions beneath, and instead of becoming like God, became the lawless one among His creations. This is the result of vainglory and prideful thoughts. Because when one seeks and desires more than the honor which he things he has, he looses it. This is what the devil suffered and which the man [Adam], who desired to be god and immortal, became mortal. And even to this day, many men suffer from this, desiring to inherit greater honor, they loose what they have. Rejoice, O Taxiarch, who was pleased with your God-given rank, and never sought to inherit more glory or position that that which was granted to you. Rejoice, O Taxiarch, leader of the heavenly powers and great helper of men, who once disputed for the body of the Prophet Moses, responding to the enemy. You did not respond with your own authority, but on behalf of God, as a lover of God and a lover of the Lord, saying: "The Lord rebukes you, O devil". In this manner, therefore, I entreat you, O head General, to cease not to rebuke the tyrant, until, though your right direction and intercessions, O one graced by God, we might meet God Who is full of mercy. Rejoice, O most-radiant Taxiarch, who stands on the right side of the divine throne, which cannot be described. Rejoice, O Taxiarch, radiant servant of the Source of light and Thrice-holy God. Rejoice, O Taxiarch and fire-bearing pillar, which formerly led the people of Israel, when they were fleeing Egypt. Rejoice, O Taxiarch, you who formerly were sent by God as a defender for the ancient peoples. Rejoice, O Taxiarch, speedy soldier of God the King, and all-glorious hoplite. Rejoice, O Taxiarch, the famed General of the heavenly army, and mighty defender of earthly soldiers. 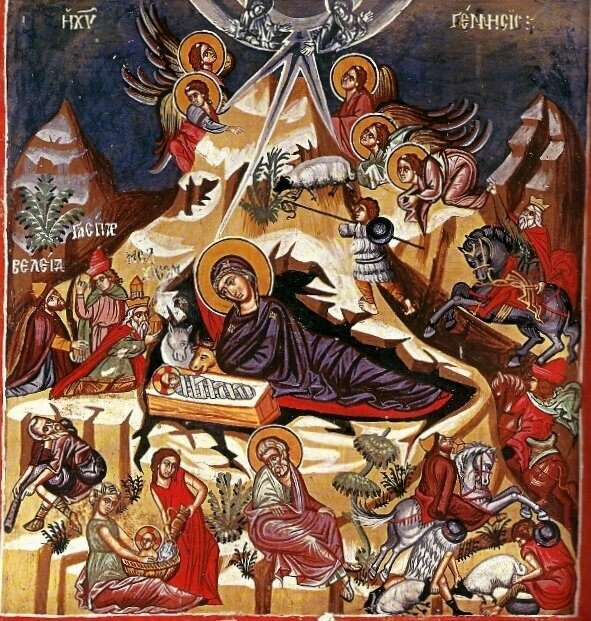 Rejoice, O Taxiarch, the great glory of the radiant angels and the incurable wounding of the dark demons. Rejoice, O Taxiarch, the supporter of kings and helper of rulers. Rejoice, O Taxiarch, who are a hoplite and head General and great fellow fighter with soldiers. Rejoice, O Taxiarch, servant of God and precious boast of His servants. Rejoice, O Taxiarch, you who are a defender of Christians and dissolver and destroyer of enemies of the faith, for, as the Scriptures say, "A punishing Angel came forth from God, and put to death the Assyrian army 185,000 men." Rejoice, O Taxiarch, protector of the faithful and destruction of the faithless. Rejoice, O good Archangel, most-glorious soldier of the Good King, for you hasten from the east to the west, performing with exactness the commandments of God, and you speedily reach the ends of the earth, the sea and the ends of the world. 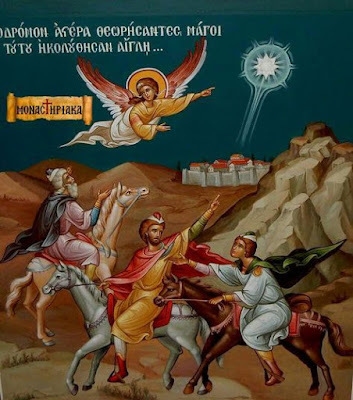 Rejoice, O Taxiarch of the divine bodiless powers, who preserved your divine church in Chonais unscathed from the raging of two rivers, Lykou and Lykokamprou, which the lawless idolaters desired to destroy your spring of holy water and your holy church and your servant, Archippos. But you, O fiery torch and fire-bearer, appeared as a pillar of fire reaching from earth to heaven, and you advised him to not be afraid of the raging of the rivers, but you stood firm so that the unconquerable power of God might be seen. And having struck the hard rock with the staff you were holding in your hand, you divided it in two, moving the flow of the two rivers into the abyss which stands to this day. And your servant, together with the holy spring of your sacred church were saved and exist to this day. This area, which formerly was named Kolasses, was renamed Chonais, on behalf of this great miracle, and the funneling downward of the waters. Rejoice, O good Taxiarch, the all-glorious General of the Good King, and the final consolation of His servants. Those who at the hour of their death are made worthy of your radiant presence, are delivered from the bitter darkness of the devil, as the darkness is dissolved by the light. This, do not cease to do for us, O all-perfect one, but now and then, "protect us underneath the shadow of your wings", and enlighten us with the light of your face. 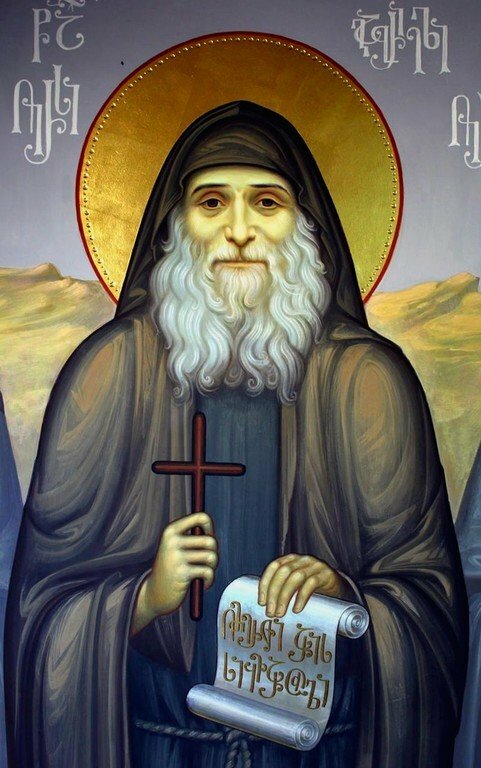 Rejoice, O Taxiarch, defender of the righteous and guide of the venerable, monastics, hermits, and dwellers in monasteries. Rejoice, O Taxiarch, who covers the modest and teaches those unlearned. 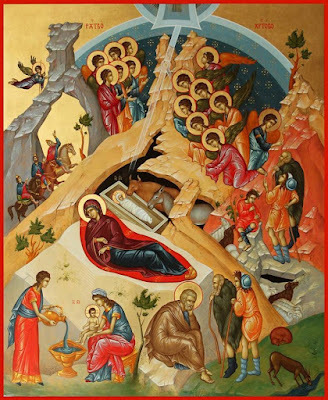 Rejoice, O Taxiarch, with a voice like a trumpet, who will proclaim the Second Coming of Christ our God, proclaiming to "heaven, the earth and under the earth", and awakening the dead who have slept for ages, to tell them mightily: "Behold the Bridegroom is coming, come forth to meet Him". Then, as the Scriptures say, the Son of Man "will send His angels to proclaim loudly and to gather thr chosen from the four corners of the world, from one end of the earth to the other". Then, O all-great Archangel of God, do not forget me, I entreat you, do not separate me, the unworthy one, from that gathering, even if it is something great which I seek, do not pass over me, I entreat you, on behalf of your speedy path. 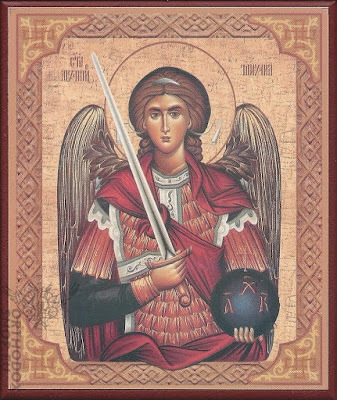 Rejoice, O Taxiarch, who is found with your fellow Angels round about God serving Him and offering Him as gifts the pure souls of the righteous. "For", as the Psalm says, "those around Him will offer gifts". Among which, O first-called by God and all-great one, entreat Him that I might be among them, together with your great and all-radiant helper and fellow-worker, the forerunner of new grace that is worthy of praise, the true divine apostle, who revealed the mystery to the Virgin [Mary], as I perceive him to be a Taxiarch like you and fellow-partaker in glory, Gabriel, the divine and most-glorious and most-perfect arch-deacon of our salvation, who is a perfect and true witness, which the scriptures bear witness to, "there is no one else to help me in these deeds, but only the leader of your nation, the Archangel Michael". O divine Michael, head General of the angelic powers, him whom I sent to you, do heal, for your divine pharmacy is always full of medicines which relieve pains. And this encomium, like the mites which the Lord received from the widow, do you receive, and make us worthy to remain in your divine church, even though we are poor spiritually and we cannot offer to you something richer or more honorable, for the height of your glory is great and granted by God. 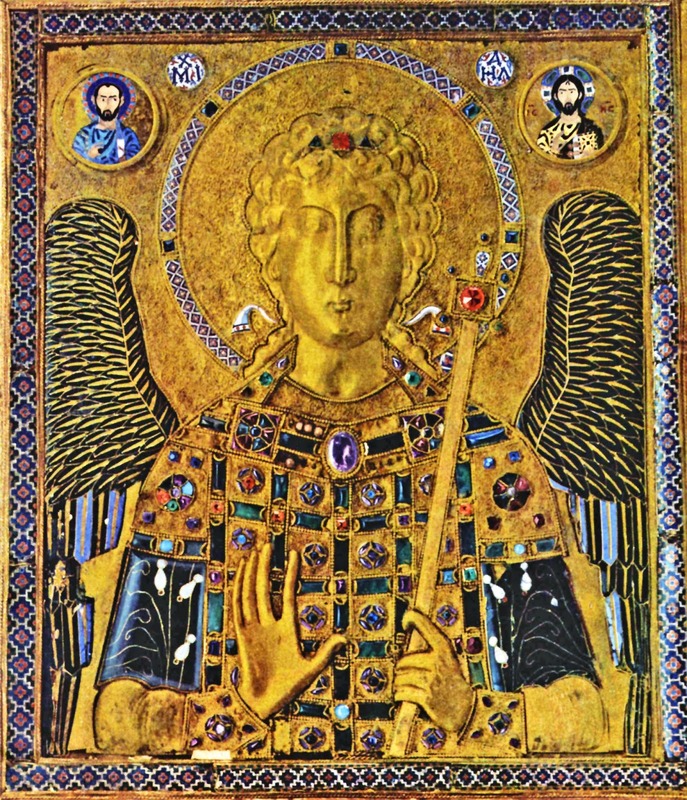 Because, we cannot honor you as is right, with our human nous, you who were hyperbolically glorified by God and honored with the command of the choir of the Angels and Archangels. Because of this, as the Lord received the two mites, you too, do receive this encomium, O one graced by God, and because you hearken speedily, and fulfill our entreaties, send him back healthy whom I sent you, that we might all, together with all who are suffering, glorify you and Him Who glorified you, for to the Thrice-holy God belongs all glory, honor and worship, unto the ages. Amen. 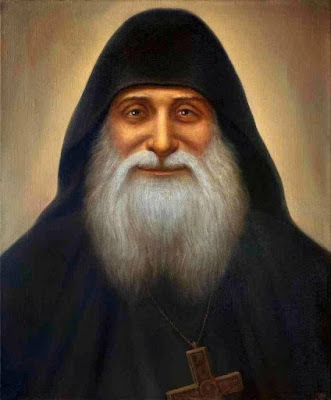 "You received in your heart the divine nectar of grace..."
You received in your heart the divine nectar of grace, O Venerable Nektarios, bestowing the heavenly sweetness of Christ upon the Church in these latter days. "O, how awesome will Your Second Coming be..."
O, how awesome will Your Second Coming be, as was foretold by the Prophet Daniel, when he said: Thrones were set up, and the Ancient of Days came and sat, being led in by the myriads of the Angels, which stand around in fear and ceaselessly cry out with their voices to the Trinity, unto the ages of ages. 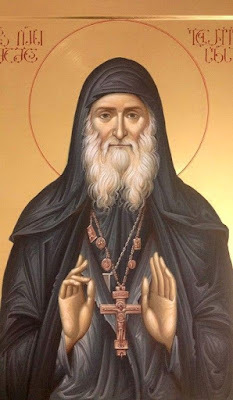 Akathist to Our Venerable and God-Bearing Father Gabriel, Holy venerable, confessor and Fool-for-Christ Archimandrite Gabriel, pray to God for us! 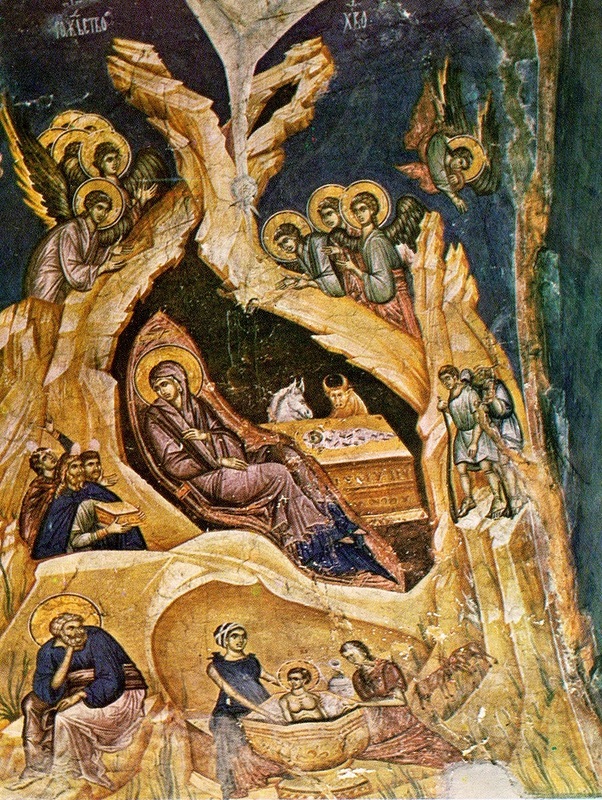 As the Master Christ hid His divinity, * clothing it in humanity, * and, unseen by us, brought into being His ineffable glory, * likewise didst thou hide thy glory by means of foolishness, * and by the wonder of thy confession wast shown forth as a shepherd of souls, * O venerable Father Gabriel, * entreat Christ God to have mercy on our souls. Immeasurable is the mercy of God, * by Whose goodness we behold His creation divinized * O venerable father, thou didst confirm in thyself the image of thy Creator * and exalted thy being to the likeness of God, * therefore we glorify thee O Father Gabriel, * for thou art worthy of all praise, * thou wast on earth a trumpet of righteousness, a preacher of love and dove of purity,* and thine all-wondrous humility * hast opened to the world a treasury of wisdom, * and now in heaven art thou, the advocate of God’s mercy and our salvation. We bless thee, O venerable father Gabriel, and we honor thy holy memory, thou instructor of monks and converser with angels. Glory to Thee, our God, glory to Thee. Bow. 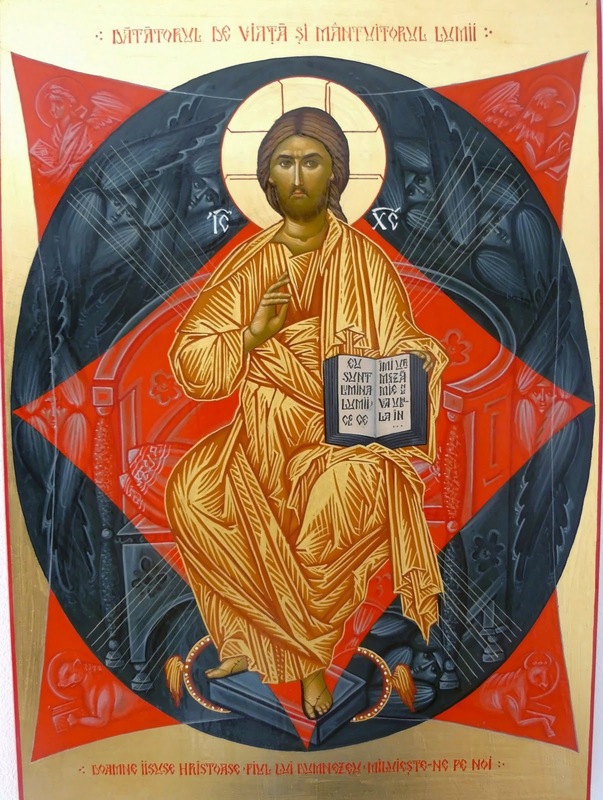 O Heavenly King, the Comforter, the Spirit of Truth, Who art everywhere present and fillest all things, Treasury of good things and Giver of life: come and dwell within us, and cleanse us from every impurity, and save our souls, O Good One. Bow. Holy God, Holy Mighty, Holy Immortal, have mercy on us. Thrice, with bows. Glory to the Father, and to the Son, and to the Holy Spirit; now and ever, and unto the ages of ages. Amen. Bow. 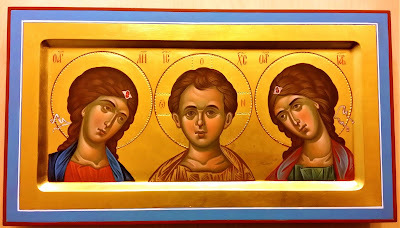 O Most Holy Trinity, have mercy on us. O Lord, cleanse us from our sins. O Master, forgive our iniquities. O Holy One, visit and heal our infirmities for Thy name’s sake. Our Father, Who art in heaven, hallowed by Thy name. Thy Kingdom come, Thy will be done, on earth as it is in heaven. Give us this day our daily bread, and forgive us our debts, as we forgive our debtors. And lead us not into temptation, but deliver us from the evil one. Lord, have mercy. 12 times. O come, let us worship God, our King. Bow. O come, let us worship and fall down before Christ, our King and God. Bow. 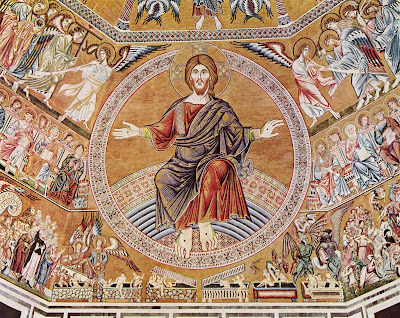 O come, let us worship and fall down before Christ Himself, our King and God. Bow. We praise thy life and miracles unceasingly with song, O all-praised Father Gabriel, for thou hast shown forth as a great luminary of Iberia, and now in heartfelt supplication we earnestly cry to thee, for thou art our all-powerful protector and mediator before the Lord, look down upon us, holy father, and protect us who are in sorrow and temptations, and with thy fatherly boldness defend us from sickness and misfortune, propitiate for us the all-powerful God that He keep us from wandering along sinful paths, and deliver from evil those who praise and chant to thee: Rejoice, O venerable Father Gabriel, holy confessor and Fool-for-Christ! Rejoice, thou who didst from youth love meekness and humility. Rejoice, vigilant guardian of the purity of body and soul. Rejoice, chosen vessel of holiness. Rejoice, thou who from youth wast a great bearer of the mysteries of the Almighty. Rejoice, double-edged sword of God destroying the danger of unbelief. Rejoice, champion of truth and strengthener of those weak in faith. Rejoice, all-wondrous preacher of love. Rejoice, counselor of repentant sinners. Rejoice, true servant of Christ the Savior in the struggle against the enemies of God. Rejoice, radiant pillar of the last times. Rejoice, great archimandrite and elder, spiritual father of Ιberia. Rejoice, messenger from above who atoned for thy people. Rejoice, O venerable Father Gabriel, holy confessor and Fool-for-Christ! The enemies of the true faith who seized power in our land persecuted the Church of Christ and its flock, and only chosen people were able to endure such a trial, those who were unshakable confessors of the faith. 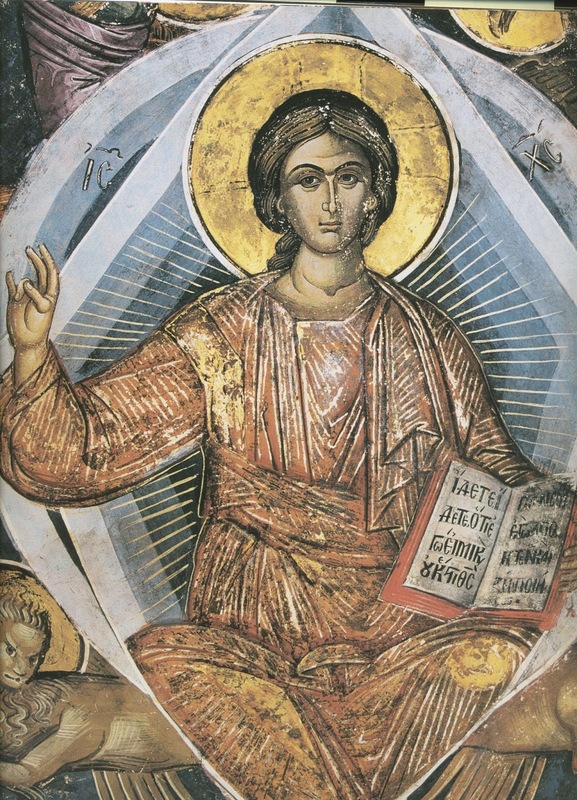 But thou, although a son of unbelievers, wast a God-chosen vessel filled with the Holy Spirit, and in the time of persecution didst thou receive with gladness of the fragrant fountain of eternal life, at all times magnifying the Giver of Light and Creator of the world: Alleluia! Rejoice, thou who like Samuel the prophet wast dedicated to God from thy mother’s womb. Rejoice, radiant spiritual light that shone as a ray of knowledge upon those in the darkness of godlessness. Rejoice, thou who wast near to God and didst distance thy mind from worldly cares. Rejoice, chosen one who from thy youth wast illumined by God’s grace. Rejoice, thou who with a sincere soul and pure mind wast ever moved by thy thirst for the Word of God. 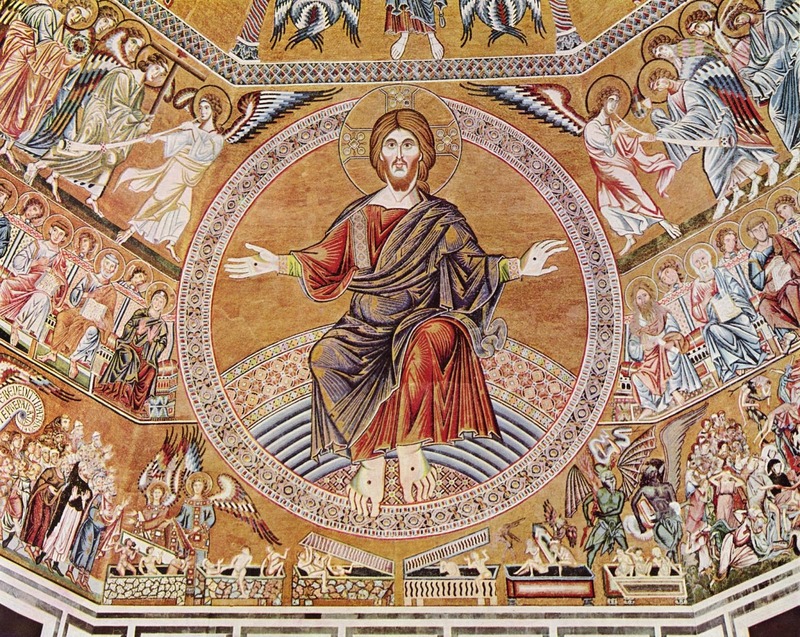 Rejoice, thou whose soul wast a dominion marked for Christ the King. Rejoice, thou who from youth wast distinguished by thy yearning for God and quickening by the Holy Scriptures. Rejoice, thou who as a child didst bear spiritual armor upon thy shoulders. Rejoice, thou who didst exchange childlike playfulness for the building of churches. Rejoice, thou who didst hate the joys that defile the soul. Rejoice, thou who didst crucify thine heart and desires of the flesh. Rejoice, for thou hast revealed the strength and wisdom of the Gospel as truth, and by thy life knowledge of holiness. Having beheld the unquenchable fire of thy love for the Lord, the insidious beast and enemy of holiness furiously assaulted thee, struck thy head with his unclean fist, and cried out indignantly: "Raise not thine eyes to the sky any longer!" But as a youth, boldly arming thyself with the Cross of the Lord and His strength, thou didst firmly stand up to the onslaught of the enemy. 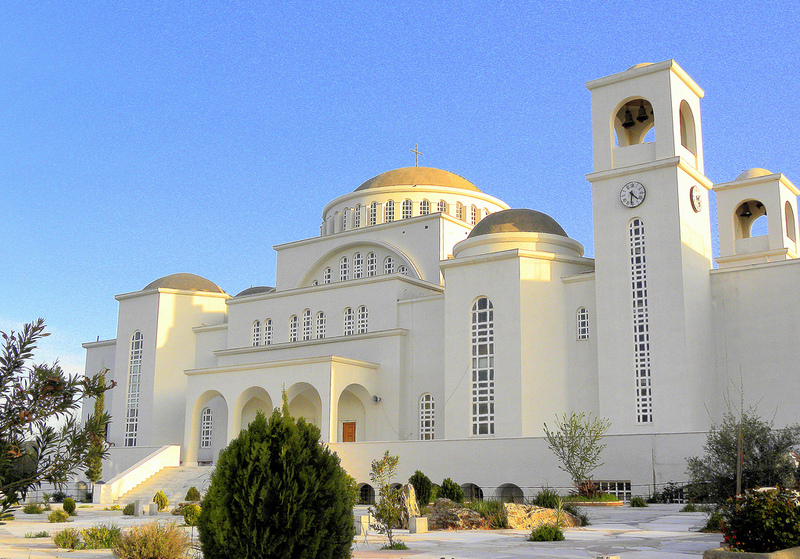 Having been directed in a heavenly vision to the Church of Saint George, which had been destroyed by thy forebears, with reverent prayer didst thou miraculously lift the stones of the church with thine own hands and lay them aside, in a feat beyond human comprehension, and with joy and love thou gavest thanks to the Lord, praising Him in song: Alleluia! Rejoice, fiery confessor who wast persecuted for the faith. Rejoice, reprover of those raging with unbelief. Rejoice, strong defender of those passionately seeking the faith. Rejoice, thou who didst abhor empty desires and accept reproach with gratitude. Rejoice, thou who didst spend nights in prayer and subjected thyself to rest upon a hard bed. Rejoice, thou who didst defeat youthful nonchalance by fasting and hard work. Rejoice, thou who dost protect us from legions of invisible demons. Rejoice, imitator of Abraham’s hospitality. Rejoice, thou who savest from hunger and art merciful to the poor. Rejoice, thou who teachest sinners the sweetness of abstinence. Rejoice, hope of the poor and afflicted. Rejoice, thou who drivest away sinful thoughts. Thou didst always seek seclusion in a small cell, struggling in diligent prayer and reading the Holy Gospel. Thou keptest thine eyes fixed upon heaven, filling thy soul with the life-giving dew of the grace of the Holy Spirit, and remaining zealous in thy life of struggle didst thou acquire virtues abundantly; in thy humility thou didst reach the depths of the knowledge of God, and having beheld a radiant cross in the sky, thou didst accept the heavenly vision as a sign of thine own Golgotha cross, magnifying the Creator and Life-Giver Christ God: Alleluia! 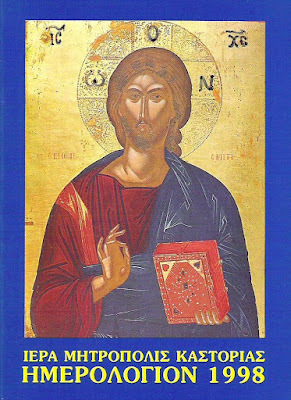 Rejoice, thou who didst unceasingly behold the Lord with noetic vision. Rejoice, thou who wast clothed in humility as if by light. Rejoice, thou who knewest what was hidden from the learned and wise. Rejoice, for thou toughened thyself by zealous fasting and relentless works, and wast filled with ceaseless prayer. Rejoice, thou who didst scorch emerging sins with sorrow, lamentations and tears. Rejoice, unshakeable strength and helper of the fainthearted and weak. Rejoice, thou who strengthenest the souls of the faithful and frightenest the evil forces. Rejoice, extoller of Christ’s magnificence and defeater of the licentious enemies of God. Rejoice, scorner of vainglory and worldly power that cometh from the evil one. Rejoice, thou who didst encourage Christian souls who suffered long under the ungodly. Rejoice, strengthener of the weak and feeble. Rejoice, teacher of those seeking the Truth on the Lord’s path. With the increase of ungodliness and persecution of the faithful, many turned away from the monastic life, and out of fear of death settled in distant villages to begin worldly lives, but thou didst firmly choose for thyself the narrow path that leads to everlasting joy, and thus didst thou steadfastly guard the Sioni temple, faithfully serving in the altar. God’s temples were being destroyed by the ungodly, but thou didst build a church in thy house, and without rest didst thou seek icons and crosses; finding them profanely discarded in unseemly places, thou didst magnificently decorate them and place them in thy temple, where we now joyously venerate them, warmly chanting to God: Alleluia! Rejoice, thou who didst reject the temptations of the world like a hermit while in the midst of a great city. Rejoice, thou who didst burden thyself with the weaknesses of others. Rejoice, thou who by zealous prayer didst drive away all despair that cometh from the evil one. Rejoice, thou who wast inspired by the Holy Spirit and didst destroy the multitude of invisible enemies. Rejoice, thou who wast fortified by the Holy Scripture and becamest perfect in wisdom. Rejoice, cohort of angels and corrector of evil brethren. Rejoice, thou who callest all to watchfulness and sobriety. Rejoice, thou who didst love the miraculous Gatekeeper of Iveron, the chief protectress of Georgia. Rejoice, thou who didst adorn thy church with sacred icons saved by thee. Rejoice, thou who settest ablaze a fiery love for God in our hearts. Rejoice, sweet intercessor before God for the Georgian people. Rejoice, offeror of our love at the Lord’s banquet in heaven. Having seen thy zeal for God, Bishop Gabriel of Kutaisi appointed thee as a novice to Motsameta Monastery, for from youth thou camest to know Christ and desired His grace above all, and sought the monastic life to leave aside worldly cares, magnifying the Lord at all times, to save thy soul. And by God’s providence thou didst receive the blessing to be clothed in a monk’s cassock, and according to thy wish wast thou named in honor of Gabriel of Athos, and now together ye behold the glory of God our Savior; pray to Him, O ye saints, that according to your example we may walk the path of this fleeting life blamelessly, always praising God the Trinity in one essence: Alleluia! 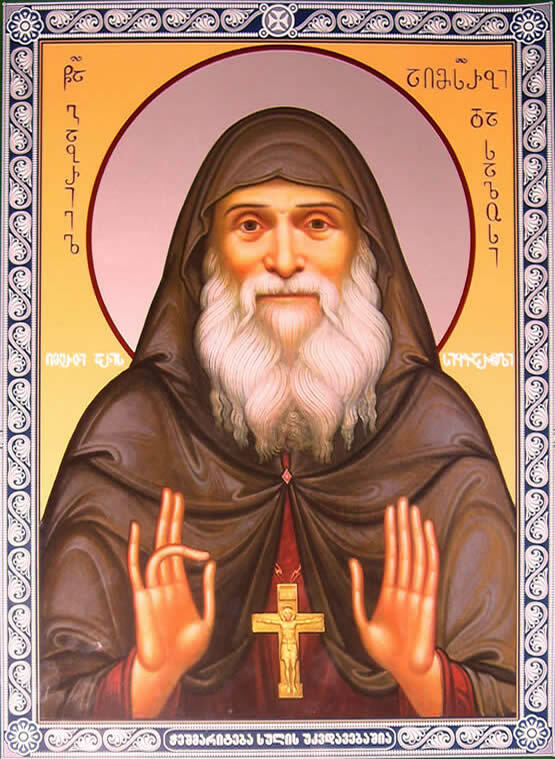 Rejoice, zealot of true monastic works known only to God. Rejoice, thou who didst strengthen thy soul with harsh vows. Rejoice, thou who didst manifest the strength of God through thine infirmities. Rejoice, thou who didst tirelessly acquire heavenly gifts and study God’s precepts. Rejoice, thou who sawest hidden kindness and gifts in others. Rejoice, thou whose words didst disperse the darkness of sin like lightning. Rejoice, thou who overcamest the eloquence of rhetoricians by true theology. 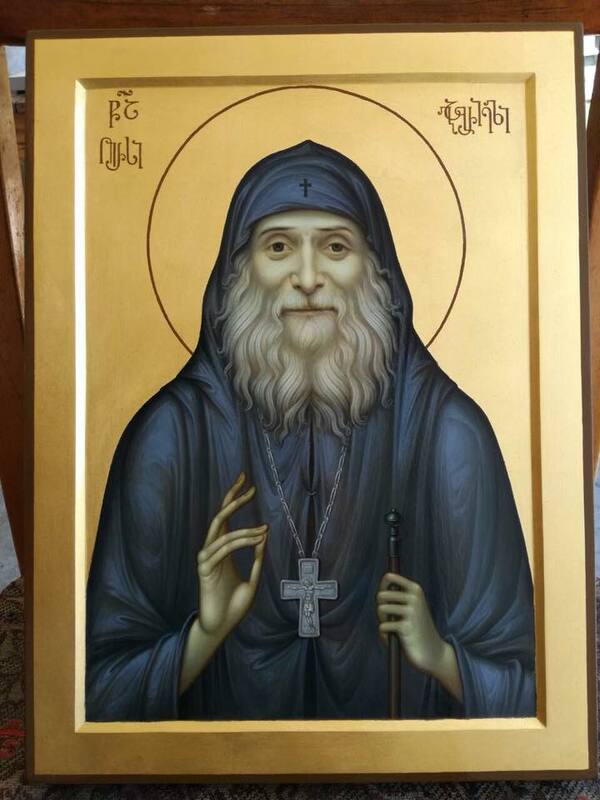 Rejoice, thou who wast a preacher of the holy Orthodox Faith equal to the apostles. Rejoice, teacher of spiritual strength and humility. Rejoice, thou who didst entreat the cruel and heartless by thy meekness. Rejoice, thou who with the Word of God preparest salvation for the faithful. Rejoice, quick hearer of those who are afflicted with sorrow and danger. Thou didst not renounce God despite calamities, tribulations, persecution and the devil's intimidation, Father Gabriel, for from youth God called thee to serve as a priest, and zealously keeping God’s commandments and joyfully preaching the Gospel, thou didst always reveal sins, direct, warn and graciously console thy flock, and preaching like the Apostle Paul, thou didst gather many souls and turn them to Christ, visiting them on holy days in the holy monasteries and churches of the Iberian land, and teaching all to chant to God: Alleluia! Rejoice, friend of Christ and tireless laborer of His vineyard. 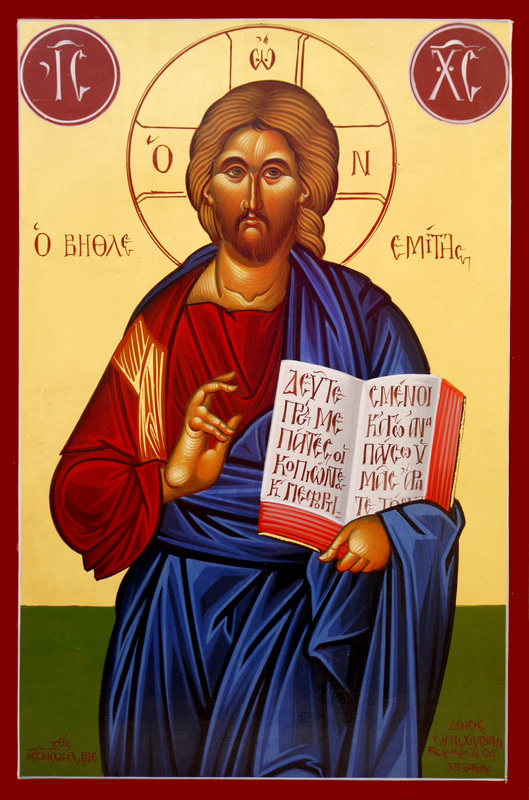 Rejoice, thou who didst acquire heavenly grace by confession of the Orthodox Faith. Rejoice, shining light of divine worship. Rejoice, thou who didst conceal thy wisdom and holiness with great humility. Rejoice, thou who didst bear the yoke of a cross adorned with sorrows for the salvation of thy people. Rejoice, leader of the faithful and advocate of priests. Rejoice, power and strength of the kings’ scepter. Rejoice, powerful vanguard and helper of monks. 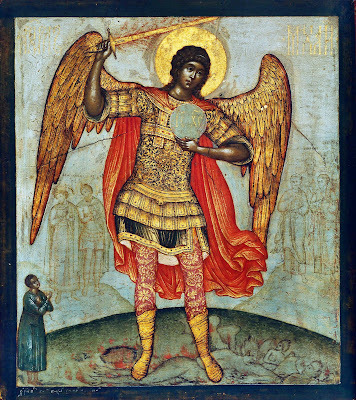 Rejoice, invincible warrior of Christ and great protector of the Georgian Church and people. Rejoice, thou who wast likened to the fathers of old according to thy piety and courage. Rejoice, thou by whose prayers all right-believing people shall trample upon the devil’s schemes, be united by love for Christ, and together serve Him in the struggle against the Antichrist and enemies of the Holy Church. Rejoice, image of righteousness and courage, and the praise and glory of Georgia. Thou wast sent to the Betania Monastery to the venerable and God-bearing wonderworking fathers George and John, and having strengthened thyself by their prayers, thou didst proceed to serve God as a zealous monk, and in the fight with evil thou wast tempered more than steel; by the Lord wast thou granted the gift of seeing into the heart, thus attracting a storm of fury from the enemy forces, who in vain tried to turn thee away from the monastery since they could not overcome the power of thy prayer and hope in the Lord, nor tarnish thy purity; thou wast loved exceedingly by thy spiritual fathers for thy virtues and together with them we give thanks to God: Alleluia! Rejoice, thou who wast likened to the ascetics of old. Rejoice, great advocate and preacher of the Orthodox faith. Rejoice, good shepherd of lambs of the chosen herd, for whom thou didst shine as a beacon in the darkness. Rejoice, sure hope of sheep that have fallen away. Rejoice, thou who returnest to the path of truth those who denied God and the faith. Rejoice, God-bearing father who didst multiply the fruits of the Lord’s harvest by thy works. Rejoice, faithful imitator of the Lord Who by His blood saved us from the curse of the law. Rejoice, thou who hewest asunder the guileful powers of darkness by thy prayers. 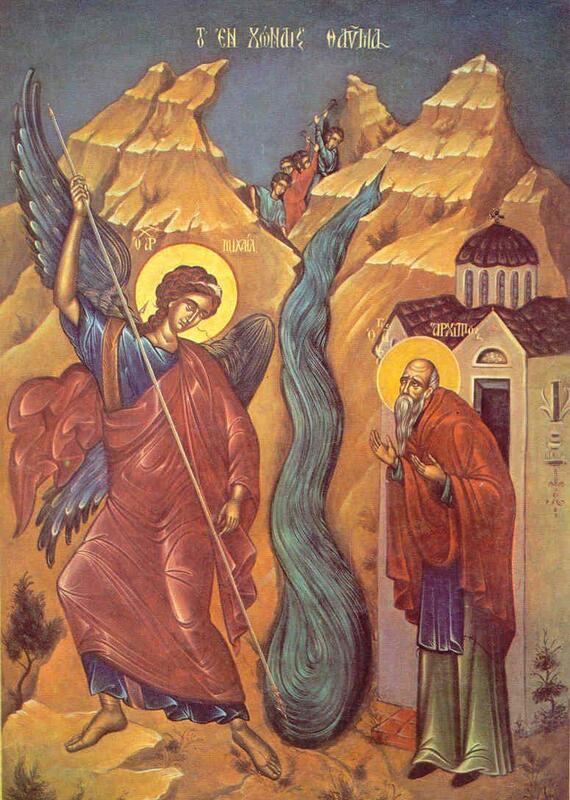 Rejoice, thou who deliverest the Orthodox from the temptations of the adversary. Rejoice, indestructible fortress, victor over godless authorities and conqueror of worldly passions. Rejoice, bulwark and praise of the faithful and servants of God. Rejoice, adornment of reverent priests and intercessor of meek servants. Rejoice, thou who drivest away despondency and healest those condemned to death. Rejoice, shelter and protection of travelers and calm harbor for the suffering. Seeing the increase of ungodliness taking hold of thy nation, good pastor, thou didst appear to a small flock, for faithlessness and abominable sin ensnared many, but thirsting for their return to piety, thou didst boldly call all to repentance, ceaselessly crying with sorrow: "O miserable ones sitting in darkness, ye are bound by your fear and silence, how could ye not see the light of Christ and His Glory? Receive your sight, and beholding Christ our God, repent, turn away from your evil paths and ceaselessly glorify God": Alleluia! Rejoice, shepherd of a small flock, who helped the unlearned understand the Word of God. Rejoice, thou who didst ceaselessly admonish sinners on God’s path. Rejoice, bold accuser of hateful rulers and dishonest judges. Rejoice, chastiser of evildoers and guide of heretics to the path of Truth. Rejoice, thou who didst reprove those who turned away from the hand of God and the worldly-hearted. Rejoice, reproach of the rising pride of this age. Rejoice, destruction of the iconoclasts’ sedition. Rejoice, protector against Satan’s schemes and foreign invasion. Rejoice, calmer of unbridled people and abolisher of the trickery of superstition. Rejoice, thou who awakenest thy people from spiritual sleep by reproof. Rejoice, thou who healest prideful souls and scatterest the darkness of our minds. Rejoice, thou who dost bless faithful spouses and reproach adulterers. Ungodly blasphemers of Christ and servants of the atheistic authorities who hated thee sought to drive thee from the path of truth by submitting thee to temptations, and locked thee in prison, but courageously didst thou denounce their craftiness and thou didst instruct and strengthen those imprisoned for the sake of their faith in Christ, and together with them thou didst glorify God. The pride of those who tried to ruin thee in their rage was soon abated, for they could do nothing to thee because the Lord miraculously protected thee from death by thy confinement to a medical ward, amongst the lowly of this world, the rejected, unpredictable and insane, where thou didst endure innumerable tortures. But this satanic cruelty shook not thine unbreakable faith, O holy father, and amidst the tortures, like the three youths in the Babylonian furnace, thou didst continue to glorify and magnify God: Alleluia! Rejoice, thou who scorchest like fire the thorns of passions with few words. Rejoice, fierce reproacher of clergy that have fallen into temptations of the world. Rejoice, reprover of those who have fallen away from God. Rejoice, thou who wast humiliated and insulted by priests. Rejoice, knower of inner thoughts, who protectest the people from temptations and offenses. Rejoice, thou who, deified by grace, richly bestowest treasures of the Spirit. Rejoice, thou who didst acquire heavenly gifts by honesty and goodness of soul and abidest in heaven. Rejoice, thou who didst understand the language of the birds of the sky and beasts of the earth. Rejoice, thou who didst open the closed church gates by the sign of the cross. Rejoice, successor of the immortal podvig of thy spiritual fathers and brothers-in-Christ John and George of Betania, with whom thou wast bound by an oath in the struggle for truth. Rejoice, thou who revealest the ungodly enemies of Christ and the chosen land of Iberia. 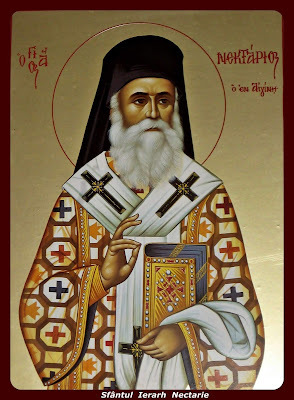 Rejoice, thou who like Saint Spyridon of Trimythous didst glorify the miraculous power of the Holy Consubstantial Trinity by changing bread into wheat, fire and water. Rejoice, thou who by wise counsel didst edify many priests and form true monks. 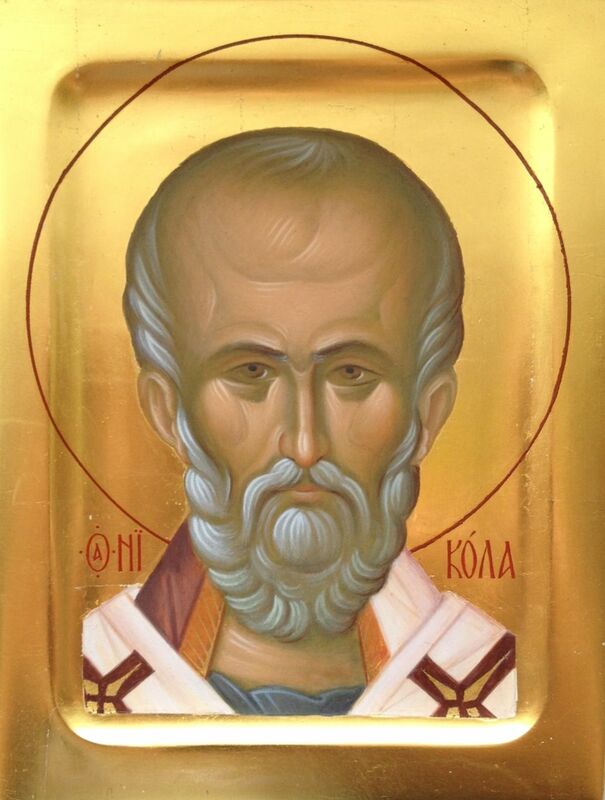 Thou wast a chosen light among the holy fathers, O wondrous elder, for words of heavenly wisdom and the vision of the Holy Spirit were granted thee, and thou didst help others by thy gift of healing, seeing into peoples’ hearts, the gift of healing the soul, and the exalted gift of love. 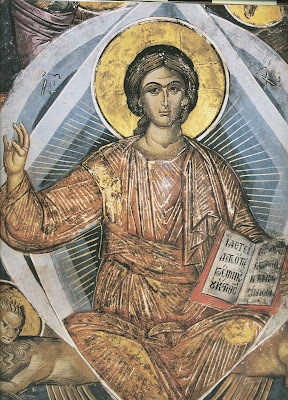 But as God marked thee with especial humility and wondrous modesty, thou didst deign to live according to the teaching of Saint Paul the Apostle that "The wisdom of the world is madness in the eyes of God," and thou didst appear to others as a Fool-for-Christ, pretending to be a good-for-nothing and drunkard, calling thyself a dog of the Savior, but in thine heart singing to God: Alleluia! Rejoice, thou who revealest heavenly mysteries, for thou didst shine with divine light in the wicked times of persecution of the truth and denigration of piety, and hast enlightened thy people by thy holiness. Rejoice, our astute father full of prayer and spiritual wisdom, for the mind of man cannot attain to the unreachable heights that were revealed to thee. Rejoice, thou who wast engulfed with divine fire, who didst reproach clergy that were wolves in sheep’s clothing, as did the prophet Elias to the priests of Baal. Rejoice, thou who like Moses didst bear thy cross for forty years, for thou kept within thyself the word of God, an indestructible pillar, revealing not the strength of man but of God. Rejoice, thou who like David the Prophet didst receive God’s mercy, and as if with a sling, didst defeat the godless by preaching the Gospel of Christ. Rejoice, thou who like John the Baptist didst tirelessly take sinners from the devil and by repentance returned them to God. Rejoice, thou who like St. John the Theologian, the apostle of love, wast granted together with the gift of love the mysteries of God and power over unclean spirits. Rejoice, thou who didst rejoice in tribulations and teach us to strengthen ourselves in sufferings by patience and faith. Rejoice, thou who like the first martyrs wast always persecuted and in sorrows, always weeping only for thine own sins. 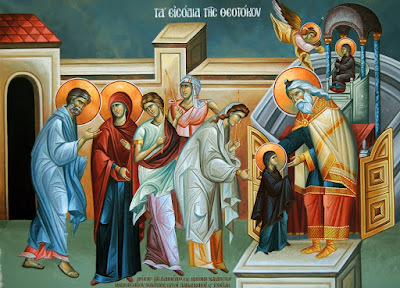 Rejoice, thou who wast in sorrow concerning thy soul as over one dead, weeping and crying out like the good thief: "Remember me, O Savior, in thy kingdom!" Rejoice, heavenly man who didst avoid worldly greatness, for thus from this time forth and forevermore people flock to thee to praise thy wondrous deeds. 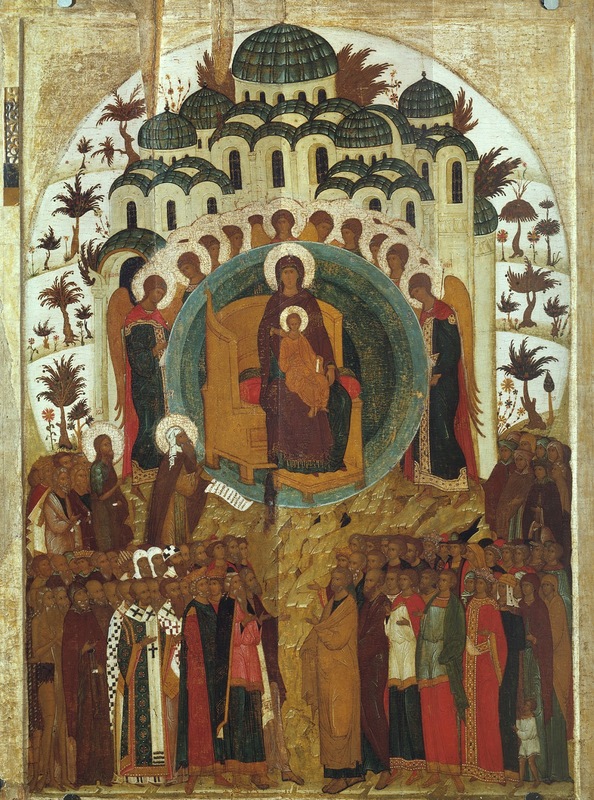 Rejoice, thou who didst entreat the most pure Mother of God for the increase of the Georgian people, and saw a vision of countless infants killed in their mothers’ wombs, and being horrified, beheld the most pure Queen with angels and heard her mournful voice say: "Why art thou asking me to multiply thy people while infants are being killed in their mothers’ wombs?" 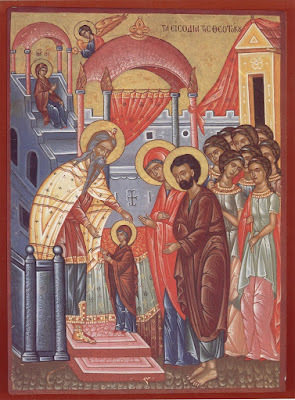 In thy humility and meekness, thou didst patiently wait many years for the blessing to again serve in church, and seeing thy modesty and burning desire to serve God, Patriarch Ephraim invited thee again to the altar, clothed thee in priests’ garments, and administered to thee the Mysteries of Christ, and inspired by God he sent thee to the holy Samtavro Monastery in Mtskheta, where thou didst settle in a small cell, O resident of the heavenly New Jerusalem, near the bush of Saint Nino the Enlightener of Iberia, where thou didst again devote thyself to offering the bloodless sacrifice and preaching the Kingdom, enlightening the nuns and thy flock, and teaching them about visible and invisible enemies. By ceaseless prayer didst thou protect the monastery from trouble, and thou didst adorn the tower of Saint King Mirian with crosses and icons found by thee, day and night glorifying the one God in Trinity: Alleluia! 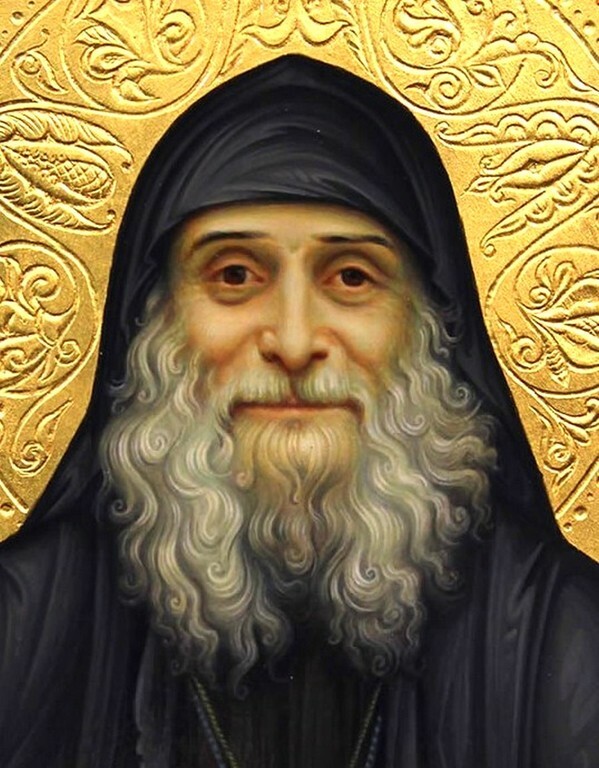 Rejoice, thou who by patience didst acquire graceful peace, and as an elder often stood against evil at the risk of thine own life, always praying to Christ God for the salvation of our souls. Rejoice, thou who hast remained close to us even after thy death as an angelic helper in this difficult age. Rejoice, thou who wast crowned with thorns, and after death shineth upon us like a hot ray of sun, ceaselessly calling us to Christ. Rejoice, for thy resting place near a blackberry bush is a wondrous tower and strength, and for those who visit it a fragrant treasury and source of true grace for the glory of God. Rejoice, for by God’s providence thy mother followed thee on the path of confession and monastic struggles, and wast buried in the holy monastery near thy relics. Rejoice, thou who art a refuge for those in misfortunes, whose tomb emanates divine fire scorching the wiles of the godless and shining like a warm jubilant light protecting us from sinful darkness. Rejoice, for not only believers, but also the lazy and those of little faith hasten to venerate the vessel of thine incorrupt blood, and pray to thee for mercy; and thou hearest their prayers, fulfilling their good wishes and giving joy abundantly to those in sorrows. 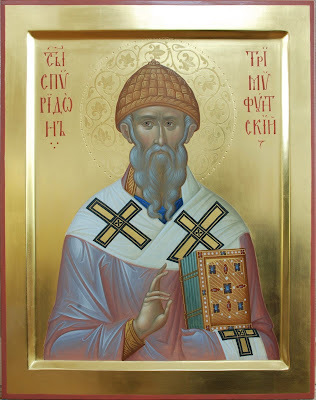 Rejoice, for hierarchs beheld the miracles flowing from thy tomb and the multitude of miracles occurring by thy mercy, and they glorified thee as a great monk, confessor and Fool-for-Christ, numbering thee among the saints. Rejoice, for many priests saw healings occur from venerating thy tomb, and now together with their flock glorify thee as a great saint, offering prayers and praise to thee. 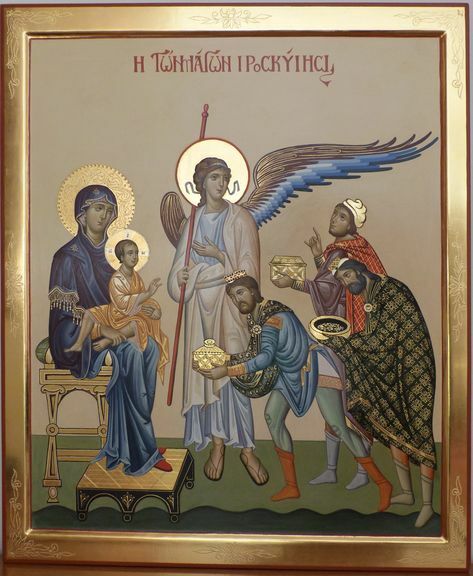 Rejoice, thou who didst work miracles for the people of God abundantly, and whose icons and images stream myrrh by the grace of the Holy Spirit. Rejoice, for now the royal city of Mtskheta is full of joy and the Samtavro Monastery rejoices at the presence of thy holy relics, and the Georgian people tirelessly gather there praising thy holiness, healings and prophecies. Rejoice, calm harbor of salvation for those perishing and the hope of the hopeless, for thou hast been revealed as a great intercessor for those suffering in misfortune; thou givest divine strength abundantly to all who come to thee, and soarest watchfully above thy homeland and people. O most glorious and most wonderful shepherd and pleaser of Christ, holy confessor and Fool-for-Christ, our Father Gabriel! Our Lord Jesus Christ blessed thee to do great works, unfathomable to the mind of man, and He granted thee rich mercy in this temporal life and upon thy death He granted thee the gift of boldly interceding for the souls of sinners. 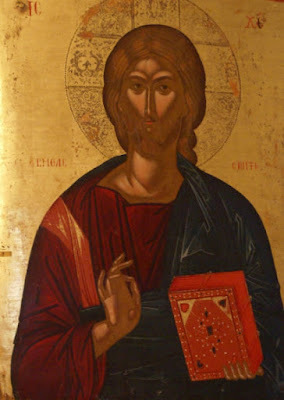 And now accept our small prayer that we offer thee with love, and as thou art a fervent intercessor, implore Christ God to deliver us from sin and wickedness, from trouble and tribulations, and that He make us heirs of the Heavenly Kingdom, so that together with thee we may cry out to God: Alleluia! Prayers: O, all-praised Father Gabriel, confessor and Fool-for-Christ! 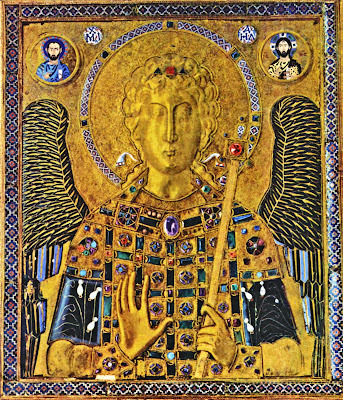 The adornment of monks, crown of priests and friend of angels, chosen warrior of the God-protected Georgian land and indestructible defender from trials and tribulations to those who pray to thee, bold advocate before God on behalf of those who are hopeless and come to thee faithfully, shelter for the doomed and benefactor of the weak! O thou who standest amongst the ranks of confessors and Fools-for-Christ, all-miraculous Father Gabriel! Having from youth chosen the angelic life, thou wast clothed in the monastic schema in a time when iniquity triumphed, and now by thine aid thou hast given us wisdom, and fortitude, and invincible power to protect our faith and homeland, for now countless enemies of the Truth have set upon Holy Orthodoxy and, as before, are cunningly trying to do evil, acting craftily and by the power of the evil one, to corrupt God’s people and turn them into servants of darkness. For we, dwelling in sinful darkness, have not the strength to oppose them, but by thine intercession, holy father, beseech Christ God to grant us the fulfillment of thy prophecies and reveal to us a king, anointed by God to rule the kingdom as a valiant ruler and leader. That He reveal one, as King David wast revealed to Israel, who shall rule in faith, kindness and by the truth, and live to care for our people, the people of the chosen lot of the Mother of God, that he may bear the Cross of Christ, unwaveringly following Him in the Orthodox Faith, that he may raise Georgia to its former honor and strength, so that countless demons with their unholy deeds may not blaspheme Christ God and the Holy Faith within her borders. By thine all-powerful and warm prayer, protect and strengthen the Most Holy and Blessed Catholicos-Patriarch of All Georgia, the Archbishop of Mtskheta-Tbilisi and Metropolitan of Pitsunda and Tskhum-Abkhazia, our father Ilia II, all patriarchs of the Holy Orthodox Church, and all clergy thereof: metropolitans, archbishops and bishops, and all the priestly and monastic order, and all who pray and toil in the Holy Orthodox Church, and all Orthodox Christians! O Holy Father Gabriel! According to thy works before God, similar to the apostles’ struggles, and knowing thy great mercy, according to thy will we humbly pray that thou wilt deliver the icon of our Savior Not Made with Hands from museum imprisonment and establish it in the Catholic Church for His holy name’s sake, in anticipation of the appearance of the Atskur Not Made With Hands icon of the Most Pure Virgin and glorious return to the land of Georgia of the Portaitissa, Gate-Keeper, "the greatest deliverer from the satanic traps and temptations of the Antichrist," according to the prophecies of our holy fathers, for as a sign of the onset of the last times this icon shall depart Mount of Athos and again illumine Iberia, her chosen lot. But ungodliness instigated by the devil is still rampant in the lot of Mother of God, and our people are ensnared in sin and the evil traps of this world, and we, overcome with laziness, fearfully await the great and terrible Second Coming of our Saviour Jesus Christ. Wherefore we beseech thee, holy Father Gabriel, to deliver us from God’s dread punishment for our faithlessness and iniquities, and by thy mercy pray to Christ, the All-Merciful God, to have mercy on our souls and enlighten our hearts with Orthodoxy and piety, that in us virtue may be increased, that upon our repose we may be enjoined to the Heavenly Kingdom and be numbered among the angelic hosts who always sing to the Lord our God, in the bright abodes of His eternal being, together with our saints, and with thee, ceaselessly glorifying His all-holy name, together with His unoriginate Father and All-Holy and Good and Life-Giving Spirit, now and ever and unto the ages of ages. Amen! 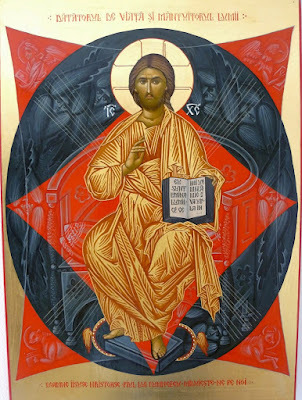 Above all, our father, all-blessed wonderworker Gabriel, who art radiant with light full of divine power, grant us our requests and give peace to those who with faith come to thy holy icon and kneel before it with tenderness, praying to thee with zeal. 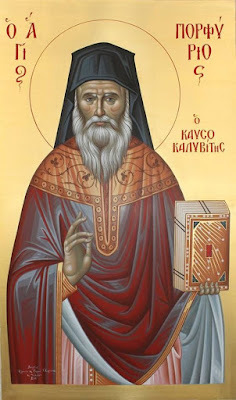 Spurn us not, being ashamed of our iniquities, but be merciful, give strength, and pray to God that we may obtain victory over the regiments of demons, flattery and wickedness of this world, and grant our people the strength to overcome cunning enemies, and keep our Holy Orthodox Church unshakeable by the world. Thy holy and honored image wast revealed to us for our salvation, for a firm faith and worship of God in expectation of His mercy; protect thy flock from all trials and tribulations, faithful servant of Christ, all-praised Father Gabriel, so that we may walk the path of life blamelessly by thy prayers and be granted the Heavenly Homeland. It is truly meet to bless thee, O Theotokos, ever-blessed and most pure, and the Mother of our God. More honorable than the Cherubim and incomparably more glorious than the Seraphim; who without corruption gavest birth to God the Word, the very Theotokos, thee do we magnify. Bow. Lord Jesus Christ, Son of God, through the prayers of Thy most pure Mother, our holy glorious and all-praised father and wonderworker Gabriel, our venerable and God-bearing fathers and of all the saints, have mercy on us. Amen!